Today’s kitchens are used for more than just preparing food. They are often playrooms, offices, mail centers, and TV rooms. When you mix up so many purposes for the same space (or even the same countertop), you’re not going to get good results. Something as simple as making a ham and cheese sandwich is impossible when your countertops are covered with bills and other papers. Instead of succumbing to this fate, set up different spaces for different tasks. Ideally, your kitchen should only be for cooking, but realistically that’s not going to be the case–especially since kitchens tend to be the center of family activity. Designate some countertop space that’s off-limits to anything but cooking or eating, and make it a point to keep it clear when it’s not being used. That way, when you’re ready to use it again, it’s ready for you. If you must bring mail and bill-paying paraphernalia into the kitchen, set up a space for just that activity and don’t let it spread out of that area. 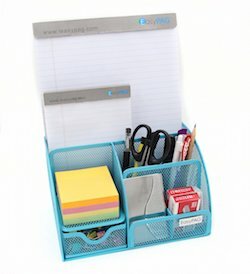 (A desktop organizer or mini-shelf is a perfect solution.) Even if you can’t dedicate surfaces to specific activities like bill-paying, storage in the kitchen can help. For example, when you finish eating at the kitchen table, you take away the dishes to wash and store in the cupboard. Why not do the same with everything else? If you pay bills, do homework, or play games at the kitchen table, make sure to clean up when you’re done. Keeping a drawer or cupboard for each activity will make it as easy and second-nature to put away your stuff.